The below artworks are the most important by Marc Chagall - that both overview the major creative periods, and highlight the greatest achievements by the artist. Artwork description & Analysis: This early work clearly shows both the Cubist and Fauvist influences at play in Chagall's canvas, yet unlike the works of Picasso or Matisse, Chagall is far more playful and liberal with decorative elements, creating a pastoral paradise out of the Russian countryside. It is an early sign of the approach that would make the artist famous and influential: a blend of the modern and the figurative, with a light, whimsical tone. Chagall depicts a fairy tale in which a cow dreams of a milk maid and a man and wife (one upright, one upside down) frolic in the work fields. Abstraction is at the heart of this work, but it exists to decorate the picture rather than invite analysis of the images. Artwork description & Analysis: Paris Through the Window appears to reflect upon Chagall's feeling of divided loyalties - his love both for modern Paris and for the older patterns of life back in Russia. Hence the figure in the bottom right looks both ways, and the couple below the Eiffel Tower seems to be split apart. Upon first glance, the picture may recall one of Robert Delaunay's many fractured portraits of the Eiffel Tower, rendered in a style often referred to as Orphic Cubism. But Chagall makes no attempt here to dissect the subject or view it from multiple angles. Instead he searches for beauty in the details, creating what writer Guillaume Apollinaire called "sur-naturalist" elements, such as a two-faced head and floating human figure. The end result is a brilliantly balanced and visually appealing snapshot of Paris, juxtaposing the imaginary and the real, all seen through eyes that are both eccentric and loving. Artwork description & Analysis: This portrait of Chagall's first wife, Bella, whom he married in the summer of 1915, also doubles as a love letter of sorts. Her demure face and figure stand over a lush pastoral landscape, larger than life, and may have been inspired by the traditional subject, The Assumption of the Virgin Mary. Chagall once remarked that, "Only love interests me, and I am only in contact with things that revolve around love." Bella with White Collar, while certainly expressive and vibrant, stands as a lasting example of Chagall's mastery of more traditional subjects and forms, yet he no less maintains the faintest of sur-naturalist elements throughout. At Bella's feet we can see two tiny figures which presumably represent Chagall and the couple's daughter, Ida. Artwork description & Analysis: Nostalgia for the artist's rustic village is at the heart of this painting. Fiddlers on rooftops were a popular motif of Chagall's, stemming from his memories of Vitebsk and the Russian countryside he called home as a child. This motif also reflects the artist's deep devotion to his Jewish cultural roots. In Green Violinist, his subject (who may represent the prophet Elijah) is an extension of the rooftops, indicated by the windows and geometric shapes in his pant legs; he is literally a colorful man, a pillar of the community, poised in rhythmic stance. Chagall also recalls with this painting the belief among the Chabad Hasidim in Vitebsk that music and dance represented a communion with God. Incidentally, the 1964 musical "Fiddler on the Roof" got its name from Chagall's paintings. 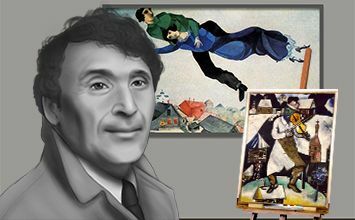 Artwork description & Analysis: Although Chagall became well known for his religious and Biblical motifs, the blatant Christian symbolism present in White Crucifixion and other works (particularly his stained-glass windows for several churches) is surprising given Chagall's devout Orthodox Jewish background. However, this work is a clear indication of Chagall's faith and his response to the rise of anti-Semitism in Europe at this time; here Jesus's suffering parallels that of his people. Jesus wears a Jewish prayer shawl, and whilst he suffers on the cross, Jewish figures on all sides of him suffer as well, fleeing from marauding invaders who burn a synagogue. The painting rather poignantly inverts the notion that the crucifixion is purely a Christian symbol - indeed that might only serve as a reminder of what divides Jews from Christians. Instead it makes the Crucifixion into a sign of their common suffering. Artwork description & Analysis: Following the sudden death of the UN's secretary general, Dag Hammarskjold, killed in a plane crash in 1961, the Staff of the United Nations set up a Committee and a Foundation to provide a "living memorial" to Hammarskjold and all those who died in the cause of world peace. The committee invited Chagall to contribute a piece of his work, and it was soon decided that the monument would be a free-standing piece of stained glass. The breadth and detail of the window is staggering, comprised of free-floating figures and faith-based symbols throughout, co-existing blissfully in a heaven-meets-earth setting. Chagall considered this window, today referred to as the "Chagall Window," not just a memorial to one man, but a thank-you card of sorts to the country that granted him asylum during his time of need in World War II.